Have you ever had plans go awry? Had a "sure thing" dissolve in the mists of uncertainty? A well practiced tune go a bit flat? Yeah? Us too! In fact, our entire year seems to have trundled well off the track we thought we'd set for it! If we've been out of touch with your recently, feel free to click the links to 'catch up'. Here was the plan - Erin and the kids return from the uncertaintly of a three month "exile" for medical treatment in the US. We'd be back together as a family, and Danna's kidneys would respond well to the "mini-chemo" treatment. She'd join Jad at the school just a couple hundred meters out our door, and they'd both have a great final school year here in Prague. Meanwhile, at work, I'd coast to the end of our three-year tour here in Prague. Ahh... (I chuckle)... how plans quickly go awry! Erin and the kids were back from the US for about a month before Danna relapsed again, and she went back on steroids (so much for the the chemo-cure). Our intricately planned ski vacation (day care for Kyler, Ski School for Jad and Danna, and "ski-dates" for Erin and me) went south when half of us got sicker than dogs (and the other half had to take care of the sick dogs). I passed the "sickies" on to Erin and the kids, who were nice enough to pass them back to me just in time for the Prague half-marathon, for which I'd been training for months (bronchitis and races do not go well together). We zipped through the summer in pretty good fashion, and things kind of went back to plan... for a while. Danna started Kindergarten, but shortly after she did so, also started a new course of drugs that severely suppress her immune system. Meanwhile, I kind of disappeared from the scene (and banished any dreams of "coasting" at work) for a while when I simultaneously took over my boss's job for the rest of our tour here in Prague, entertained guests from the White House, and hosted 160 of my colleagues for a regional conference. By the end of October, the Rubesh Jalopy looked to be heading back to the Autobahn when we hit another detour... by the name of Swine Flu. As you may have read in the news, severely suppressed immune systems do not get along well with Swine Flu, and Danna's combination of strong medications and underlying health issues made her high risk for complications. Vaccine? Nowhere in sight. Jad and Danna went from ISP (International School of Prague) to RSP (Rubesh School of Prague) starting in November. Erin went from Chief Domestic Engineer to Educator in Chief. Ever tried to homeschool a first grader and kindergartener with an energetic toddler underfoot? Yeah? Not easy, eh? As if teaching / babysitting / cooking / mothering wasn't enough, the search for H1N1 vaccine was on. We looked under each rock and around every corner - emailing Doctors, Senators, and even the White House! In the end, the US Army came through, and we got the entire family vaccinated at a nearby base. By now, you're probably wondering... "Wow - that's great and all, but I thought this was going to be a Christmas letter." Well, I was thinking the other day about the challenges of this year... and realized that all this "planning gone awry" stuff is really nothing new. In fact, the central characters in the Christmas story had a year even more chaotic than ours has been! I'm sure you've all heard the story - but here's what stood out to me this year. Joseph strikes me as my kind of guy. He was a planner - you kind of have to be, to be a carpenter! No doubt he spent months planning his wedding - only to find out his fiancee was pregnant. Talk about a change in plans! He had just about finished redrawing his blueprint, deciding to protect Mary and end the engagement quietly when he got a visit from an Angel. Hard to plan for that! Knocked back onto his original track by the heavenly visitor, the dutiful husband probably starting working on getting the house ready for the new addition. Until the next bombshell hit - this one in the form of the Roman Emperor! Before you know it, he and a very pregnant Mary are on the road to Bethlehem - over 100 kilometers away - to take part in Caesar Augustus' census. This is back before you could hop on the internet to plot the best route and reserve a room at the inn. By the time they arrived in Bethlehem, there wasn't a bed in town! As a planning Dad/Father/Provider that's gotta hit hard! Fortunately, the baby arrives safely, Mary's OK, and apart from a couple unexpected visitors with sheep and camels in tow, things are looking good. Soon it's back to the woodworking shop , home, and "the plan"... right? But no - now a jealous King Herod's after Joseph and son, and the story takes another dramatic and unexpected turn - an exile in Egypt! Unexpected pregnancies. Angelic visits. An Imperial summons. Death threats and exile in a faraway land. And I thought our year had surprises! The thing of it is... even though Joseph's year probably was nothing like what he had planned, the twists and turns fit perfectly into God's design. Amid the chaos of upset plans and unexpected detours, God's plan was born - in the shape of an infant... lying in a manger. In the commotion of a crowded stable the Prince of Peace entered the world. Our year? Definitely not one for the planner in me! But if the story of Bethlehem is any indication, God uses the shattered pieces of our best laid plans to accomplish His purpose. Among the joy of presents, trees and wrapping paper this Christmas lies the reminder that the real reason for the season will continue to guide us, and give us Peace no matter how many unexpected twists and turns our path takes. 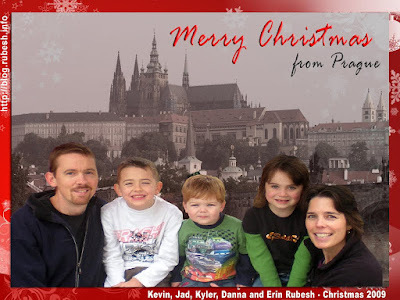 God bless, and Merry Christmas from Prague!